I meant to post this call for submissions earlier, but somehow got sidetracked! I am all for supporting local authors – and encouraging young readers is essential! The Ghana Book Trust and CODE, a Canadian NGO, have the pleasure to invite Ghanaian authors and publishers to participate in a competition to produce story books for the young between the ages of 12-15. 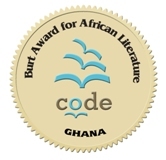 The Award is sponsored by CODE, a Canadian NGO, with generous support from Canadian patron Bill Burt. These would be paid at the prevailing exchange rate at the time of the award in Ghana Cedis. Winning publishers are guaranteed the purchase of 3,000 out of 5,000 copies expected to be published. The books will be distributed to Ghana Book Trust’s network of CODE-supported schools, community libraries and other schools. They will be reviewed and assessed by a panel of qualified judges to determine the winners. The Ghana Book Trust is not obliged to award any or all the three prizes if the judges deem work unsatisfactory. Winners:The winners will be announced through the media.